News, Entertainment, Gossip, Health,food and Politics we bring you your favorite infotainment. People's Democratic Party chieftain, Atiku has urged Nigerians to stand up to change the status quo before things get worse. 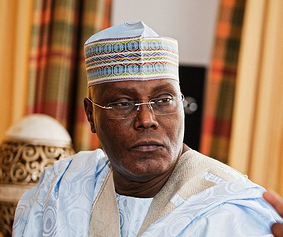 Former Vice President Atiku Abubakar has challenged Nigerians to rise to change the present state of affairs in the country if they truly desire to continue to have a country. Atiku, who observed that Nigerians have never had it this bad since the Civil War, predicted that Nigeria may soon have between 25-27 PDP States, as the people are already fed up with the hardship and intolerable disposition of the present APC-led government. Speaking at the PDP Secretariat during a consultation visit in Uyo on Wednesday, the PDP presidential hopeful regretted that those who are making Nigeria unbearable for its citizens today, were not part of the struggles towards the actualization of democracy. His words: “The country is in its worse state today. I have never seen it since the civil war. Ethnic division, north against south, this is very very dangerous for our survival as a country. “We must do all what we can to address this situation. We have to unite together to arrest this, otherwise you would one day wake up and find out that we don’t have a country, God forbid. “We may end up with 25-27 PDP states in Nigeria, because every part of this country is fed up with this government. And this is the most intolerant government I have ever seen in this country. And unfortunately for us, he was not even part of this struggle. “The situation in APC states is horrible. You cannot even meet like this. They are intolerable because they were not part of the struggle for actualization of democracy. If PDP was like this, there would not have been any opposition party in this country. “Let us therefore unite and make sure that we free this country and our people from this situation. The political restructuring of this country is inevitable, whether we like it or not. “We must deploy resources and powers to the federated units of this country. If states and local government areas are given more resources and powers, the people would hold them accountable”. He decried the disunity, ehnicity, division and religious intollerance so far promoted by the present federal government, noting that such was quite dangerous for the continued survival and oneness of the country. He maintained that given the extent of decay in the country at the moment, Nigerians would need to support a candidate with the qualities, capacity, experience and the qualification to face the challenges. “I can do that job, but only with your support,” he assured. Earlier, the former National Chairman of the Peoples’ Democratic Party, Chief Jim Nwodo, said Nigeria has reached the lowest point where hunger, poverty and killing of the people have become the order of the day. He described Nigeria as a country under sieze when there is no war, adding that the present federal government has failed to fulfill its campaign promises. “We have never had it this bad. We were promised we’ll never go abroad for medical treatment, but the person who made the promise is first to go. “Someone we’ve not seen his school certificate calls our youths lazy. In this state of total hopelessness, we bring a Messiah today. An exemplary entrepreneur, who recognizes intellect”. In their goodwill messages, stakeholders of the Peoples’ Democratic Party in Akwa Ibom State unanimously expressed optimism that Atiku has the pedigree and the distribalized disposition to pull Nigeria out of its present predicament. The party leaders consisting the state Party Chairman, Obong Paul Ekpo, Senator Anietie Okon, Sen. Helen Esuene, Chief Ndueso Essien, former Governor Chris Ekpenyong recalled Atiku’s role during the resource control struggles. They unanimously stressed the need for restructuring Nigeria and assured that Akwa Ibom practises PDP as a religion. “If the state governor this time around gives a directive that is not in our collective interests, we the elders of the party would deviate,” Ekpenyong assured.